Another protest drubbing for Conservatism in yesterday's two local District and Parish council elections but an even bigger disappointment for Labour in the mid-term of an unpopular coalition government. Once again, the UKIP vote prevailed (see results below) and I really don't believe that anyone was really surprised at the result. Yesterday, I had an exchange of views with an old friend, Michael Fabricant, the Government Whip and he assured me that at Westminster local results of this kind are being taken very seriously indeed. I'm at a meeting in Parliament on Monday evening and so will be very interested to hear the opinions of my colleagues in the committee room. What the last seven days illustrates is that Labour are no longer the main party of opposition and the LibDems have become locally irrelevant to the point of non-existence, as the public's resentment over their grip on coalition policy grows. Labour have nothing really new to say other than deliver promises on the economy and welfare, they know they can't possibly keep. The big debate has moved elsewhere. Not to a financial crisis and a national debt accruing at £1,600 per second but to our place in Europe and most of all, immigration, which until not long ago was a subject that would raise howls of 'racism' from the socialists and politically correct; not be discussed in polite company. Quite how David Cameron's Government now disentangles itself on central issues of Europe and Human Rights, from the corrosive brand of Nick Clegg and the LibDems, I really don't know. By voting UKIP, people are telling Government what they want but only one Party, the Conservatives, are prepared to listen or even consider a referendum on Europe, amending the Human Rights Act or far-reaching changes on immigration. Both Miliband and Clegg are now on the same page on Europe. They believe that David Cameron’s promise of an in/out referendum by 2017 could put job-creating foreign investment at risk and lead to the EU exit door. I have a sense that Government is now trapped in a cage and the public are now enjoying the opportunity of poking it with sharp sticks. But like UKIP, aren't really able to express what they really want beyond leaving Europe, the introduction of passport control at Birchington, bigger sticks for the police and if we are really lucky, free beer and the Sky Sports Channel on Sundays. The real losers of the last week's results are likely to be the people of Thanet, because there will be no overall control of the Council, more facile bickering over subjects that have no real place in local government and new members of Kent County Council, with large budgets to administer locally and no clue about the gears of local government or influence over the big machine that holds a responsibility for our schools and roads. In one example, a retired, elected member for Herne Bay is still, I'm told away on a cruise because he never expected to win at the polls last week. Meanwhile, here's a favourite clip to revisit with last week's military coup in Maidstone and the overall political balance in Kent in mind. Cliftonville East Results: Rozanne Duncan (UKIP) 699 (41%) Wendy Chaplin (Conservative) 526 (31%) Alan Currie (Labour) 352 (20%) Louise Oldfield (Independent) 112 (7%) Proctor (Liberal Democrat) 32 (2%) Total votes 1,721 (35% turnout). Well R Duncan didn't do much when she was a Tory - lets hope she gets her finger out this time! All I would say though is that if ALL Cllrs, whether local or at KCC, are truly working for the good of their own communities, then having newbies on the job shouldn't matter too much. They should be given all the help and support they need as far as practical matters are concerned to ensure that they can do their job properly. Of course, if more long standing Cllrs decide that party politics is more important than anything else and will not aide newbies then it will of course be obvious, and they will have to accept some of the responsibility for any failures! I think any reasonably intelligent person should be able to learn a new job on the job and hope this will be the case, regardless of political colours. As you say though, some egos are far too big for the job and bickering prevails. Shame on those people. Maybe the newbies can set an example of how to behave and how to be proud and respectful of the position in society Cllrs hold and the more long standing Cllrs can actually learn something from them and stop their bickering for the good of the Community! 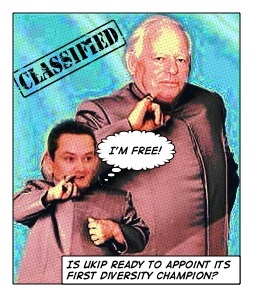 Haha, love the John Inman-inspired "I'm free"! The real disappointment here was for the local conservative candidate who in a very safe seat lost by a big margin. The mistake that Cameron and Gale continue to make is they happily taunt the UKIP voters by continually calling them racists. Is this honestly a way to win back the disenchanted Tory voters who have abandoned Cameron and Gale in droves ? I, for one, am pleased to see Gale is standing again - such is the mans vanity that he believes he has a chance in 2015 - like Cameron, I think he will be leaving politics in shame. Has anyone else noticed that Roger Gale is looking very tired these days. He seems determined to self destruct - like a lot of Tories in this area ! Two things that really bother me, the first is the article in the giveaway rag that is free and comes through everyone's door in which he states he is on the side of Birchington Surgery and he dismisses the petition and complaints of the patients, and secondly, he continues to repeat the slur of UKIP supporters being closet racists. It is time he started representing the few supporters he has left instead of dismissing their concerns at a surgery he doesn't use (he enjoys private healthcare at our expense but he keeps that quiet - and incidentally all MP's do) and insulting 26% of the voters who DIDN'T vote for his party ! Yes, I think he is tired. Roger Gale still has plenty of supporters, and doesn't need to worry about a few UKIP defectors or militant homosexuals. Watched HIGNFY last night. Some MPs come across very well, others make a fool of themselves. Sadly the hair was funnier than the man last night. Re Birchington Surgery. Where can I find this petition? We don't get free newspapers in my road in Birchington so have not seen the Roger Gale press item. If UKIP were really determined to get into government they should only contest Labour held seats at the next election, leaving safe Conservative seats alone. This way the country will get the sort of government it is so clearly asking for. Any other course will let Miliband, Balls, Harman etc. back to create more mayhem, and allow the Lib Dems to become potential king makers again.